“Identity matters for security outcomes”, writes Jarrod Hayes in this fascinating roundtable on his 2013 book, Constructing National Security. Is there anyone working on international security today who can possibly think otherwise? Even the most diehard rationalist must surely recognize the importance of identity to President Donald Trump’s worldview, and to how other states, whether allies or adversaries, are developing their security policies in response to Trump’s election. But how much does identity matter? And when does identity matter? These are thornier issues. In answering these questions, both Constructing National Security and the contributors to this roundtable offer much food for thought. Jarrod Hayes. Constructing National Security: U.S. Relations with India and China. Cambridge: Cambridge University Press, 2013. ISBN: 9781107040427 (hardback, $113.00). Identity matters for security outcomes”, writes Jarrod Hayes in this fascinating roundtable on his 2013 book, Constructing National Security. Is there anyone working on international security today who can possibly think otherwise? Even the most diehard rationalist must surely recognize the importance of identity to President Donald Trump’s worldview, and to how other states, whether allies or adversaries, are developing their security policies in response to Trump’s election. But how much does identity matter? And when does identity matter? These are thornier issues. In answering these questions, both Constructing National Security and the contributors to this roundtable offer much food for thought. Constructing National Security argues that identity is a crucial component of how democratic states conduct their security policies. For Hayes, ‘democratic identity’ works as a frame that simultaneously opens up and closes down policy avenues (xi). In other words, identity exerts ‘boundary conditions’ around when and against whom democratic states can plausibly use force (5). Central to Hayes’ argument is the ways in which democratic publics share affinities across borders, inclining security policies in these states towards nonviolent conflict resolution rather than armed conflict. Hayes illustrates this argument through detailed examination, based on meticulous primary research, of how the U.S. has ‘securitized’ security concerns with a non-democratic state (China), and ‘desecuritized’ them with a democratic state (India). All three reviewers see Hayes’s argument as significant. It is easy to see why. Hayes takes the ‘hardest’ of issue-areas (security) in International Relations (IR) and makes a strong case that this sub-field should be understood less through rationalist logics than through identity mechanisms. At the same time, Hayes adds important ballast to democratic peace theory by showing why security threats between democracies tend to defuse rather than escalate. Finally, Hayes helps to foster links between U.S. and European IR by opening up constructivism to ‘securitization theory’, a strand of work that has thrived in Europe, but made few inroads into the U.S. The reviewers praise Hayes’s ambition and the quality of his scholarship. They also raise a number of important questions: whether ‘democratic identity’ is as strong an influence on securitization as it is on desecuritization (Park); how publics gain information about other democracies and whether this maters (Gill); and the extent to which Hayes’s theory is generalizable beyond the U.S. (Waever). In his response, Hayes concedes considerable ground to the reviewers, preferring to see their critiques as a chance for clarification rather than disagreement. Three issues stand out as worthy of further discussion: how far conceptions of democratic identity can be stretched; the extent to which publics affect the development of security policies; and whether Hayes’s primary contribution is to democratic peace theory or to debates about securitization. First, in somewhat unreasonable mode: Constructing National Security has the strong sense of being a pre-Trump book. The strand of populism that Trump represents equates the leader with ‘the people’. Not only does this make Trump both the subject and object of any securitizing move, it also means that some sections of ‘the people’, such as ‘the establishment’, are axiomatically outside ‘the public’. Trump’s reduced public appears to have relatively slight levels of ‘democratic identity’, and even slighter affinities with democratic publics overseas–there is certainly no sense of a Trump-fuelled democratic identity travelling south. Nor do Trump’s ‘people’ appear to differentiate how they perceive democratic and authoritarian regimes. This anti-establishment populism is a trend that extends well beyond the U.S.–it can also be seen in Europe (e.g. Le Pen), South Asia (e.g. Modi), Southeast Asia (e.g. Duterte), and Latin America (e.g. Kirchner). As such, future work needs to assess what type of democracy produces the ‘democratic identity’ that Hayes sees as crucial to promoting non-violence between democracies. Does Hayes have in mind only the (pre-Trump) U.S., or other states in the Americas? Is he including all European states, or only those in the northern part of the continent? What about Turkey, Tunisia, Malaysia, or, stretching the point, Iran? Democracy is a much-contested term; it is also one that is regularly redefined. How we understand this issue matters greatly to the universe of cases that Hayes’s theory can accommodate. The second issue arises from the weight Hayes gives to public opinion. It is both difficult to reliably access public opinion and even more difficult to assess what role it plays in security policies, something picked up by David Gill in his review. Hayes relies on polling data and various proxies for public opinion, such as newspapers and congressional debates. This is a wide field, and also an inexact one. It is also one that is getting ever more inexact and ever wider, as people increasingly get their news, and devise their opinions, not from mainstream media outlets or their elected representatives, but from a cornucopia of echo chambers and algorithm-determined social media. On the one hand, therefore, there is no monolithic ‘public’ out there. On the other hand, it is difficult to trace the impact of these multiple publics on security policy. At times, as Hayes notes, U.S. publics were disengaged from the cases he examines, particularly the 1971 Bangladesh War. (76) At other times, public opinion does not appear to work the way it is supposed to. British public opinion, for example, was stubbornly hostile to the war in Iraq during the build-up to the 2003 invasion. Despite a concerted public relations campaign by the government, largely oriented around the undemocratic nature of President Saddam Hussein’s regime and the danger it presented to the UK, public skepticism did not abate. Yet the government went ahead with the invasion. So how determinate is ‘democratic identity’ within contemporary publics, particularly given their fracturing? And to what extent do these publics actually influence policy makers when it comes to the use of force? The final issue concerns Hayes’s use of securitization theory. As Ole Waever notes in his review, Constructing National Security is concerned with cases of armed conflict. This makes sense when making a contribution to scholarship on the democratic peace. It makes less sense when making an argument about the array of issues that securitization theory encompasses. The Trump White House is currently securitizing its relationship with Mexico. As pointed out by Seo-Hyun Park in her review, Japan and South Korea regularly engage in bouts of securitization. Some democratic states securitize ‘the enemy within’: the Tamils in Sri Lanka, the Naxalites in India, the Chinese in Indonesia, refugees and migrants in Australia and many parts of Europe. Sometimes, democratic states have engaged in armed conflict, as in the case of Israel and Lebanon in 2006. In all of these cases, ‘democratic identity’ appears to have played little role. As Hayes acknowledges in his response, this means that Constructing National Security ends up being less about security in general than about a specific aspect of security. This does not directly challenge the many virtues of Hayes’s important book. But it does help to clarify its limits. George Lawson is Associate Professor in International Relations at the London School of Economics. His books include Global Historical Sociology (Cambridge University Press, 2017), edited with Julian Go, The Global Transformation: History, Modernity and the Making of International Relations, with Barry Buzan (Cambridge, 2015), The Global 1989: Continuity and Change in World Politics (Cambridge, 2010), edited with Chris Armbruster and Michael Cox, and Negotiated Revolutions: The Czech Republic, South Africa and Chile (Ashgate, 2005). He is currently completing a book entitled “Anatomies of Revolution”. David James Gill is Associate Professor of International Relations at the University of Nottingham, Research Associate for the Centre for Financial History at the University of Cambridge, and author of Britain and the Bomb (Stanford University Press, 2014). His work has appeared in print or online for the Economic History Review, Foreign Affairs, International Affairs, International Security, Journal of Cold War Studies, and Journal of Strategic Studies. Seo-Hyun Park is an assistant professor in the Department of Government and Law at Lafayette College. Her research interests include hierarchy and regional orders, national identity politics, state sovereignty, and military alliances, with a regional focus on East Asia. Her work has appeared in the Review of International Studies, Journal of East Asian Studies, Strategic Studies Quarterly, and the Chinese Journal of International Politics. She is currently working on her book manuscript on the effects of hierarchy as a political-historical context in East Asian international relations. Park received her Ph.D. from Cornell University and has been a recipient of research fellowships from the Japan Foundation as well as Center for International Security and Cooperation (CISAC) and the Shorenstein Asia-Pacific Research Center (APARC) at Stanford University. She has conducted research in Japan and South Korea as a visiting researcher at the University of Tokyo and at Yonsei University. Ole Wæver, Ph.D., Dr.h.c.. is Professor of International Relations at the Department of Political Science, University of Copenhagen, and Director of the Center for Resolution of International Conflicts. He was the founder and from 2008 to 2013 the director of Centre for Advanced Security Theory. Much of his international repute stems from coining the concept of securitization and co-developing what is known as the Copenhagen School in security studies. Beyond security theory, his research interests include the history and sociology of the International Relations discipline, philosophy of science, sociology of science, religion in international relations, climate change, conflict analysis, transformative technology, and the role of national identity in foreign policy. He has been a member of the Danish Defense Commission of 1997 and various other policy advisory bodies in the areas of security, climate and research policy including the advisory group for a 2016 review of Danish foreign policy (Taksøe report 2016). Among his main books are Security: A New Framework for Analysis with Barry Buzan and Jaap de Wilde (Lynne Rienner ,1988), Chinese 2002, Czech 2006); Regions and Powers: The Structure of International Security with Barry Buzan (Cambridge University Press, 2003), Chinese and Persian translations 2009); International Relations Scholarship Around the World, ed. with Arlene B. Tickner (Routledge, 2009); Climate change: Global Risks, Challenges & Decisions with Katherine Richardson et al (Cambridge, 2011). His articles have appeared in Journal of Peace Research, International Affairs, Cooperation and Conflict, Journal of International Affairs, Journal of Common Market Studies, Review of International Studies, International Organization, Millennium, Security Dialogue and International Relations. Ole Wæver was elected to the Royal Danish Academy of Sciences and Letters in 2007, received the Carlsberg Research Prize 2012, became Knight of the Order of the Dannebrog in 2014, was the first recipient of the Hesbjerg Foundation Peace Prize in 2015; and received an honorary doctorate from University of Turku in 2015. 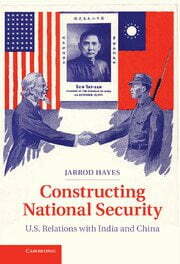 In Constructing National Security, Jarrod Hayes does not shy away from difficult questions. Why do democracies refrain from using force against each other? What explains the variation in U.S. security policy towards rising powers? How can U.S. policymakers construct their security policies effectively vis-à-vis the American public? To answer these questions, Hayes draws on securitization theory and social psychology to provide a novel study of U.S. relations with India and China, selecting key focal points from 1971 to 2005 as the basis for his analysis. Constructing National Security is evidently bold and innovative, but it is also engaging and persuasive. Hayes’s sharp analysis and thorough research help to make this book an enjoyable and significant contribution to the field of International Relations. Hayes begins by arguing that the puzzle of the democratic peace has not yet received sufficient attention. Indeed, this particular scholarly deficit was the genesis of his book (ix-x). Such a statement might seem curious given the wealth of research dedicated to testing the phenomena. To be sure, Hayes recognizes the existence of such work and he rightly praises its many significant contributions. Quantitative analyses concerning the existence of a zone of peace between democracies have been very important to scholars and policymakers. Nevertheless, Hayes stresses the neglect of the mechanisms, dynamics, and processes that generate the phenomenon itself (x, 163). In an impressive innovation, he draws on a combination of identity analysis and securitization theory to offer a convincing explanation of this long-standing puzzle. In terms of the three key elements of any securitizing move—namely, the securitizing actor, referent object, and audience (15-16)—Hayes argues that democracies cannot securitize other democracies as threats, because their own domestic audiences reject such characterizations. Democratic identity informs securitizing moves in the United States with respect to other democracies by making security claims extremely difficult, shaping what policymakers can and cannot construct as a threat (1, 159). The value of this theoretical statement is unmistakable. By explaining how domestic dynamics help to shape international security outcomes, Hayes provides a more nuanced understanding of the constraining influence of democratic publics than that presented in much of the democratic peace literature. The study of democratic identity in security relationships also provides important insights into variations of U.S. policy towards rising powers. As Ted Hopf rightly notes on the back cover of the book, Hayes’s argument is so powerful because it simultaneously explains why democracies do not fight each other and why democracies can be more bellicose than authoritarian regimes. In sum, democratic identity “both facilitates and inhibits securitization by empowering and undermining the claim of an existential threat” (1-2). Analysis of U.S. relations with China and India ably evidences this claim; democratic identity is a key variable in the success of efforts by the United States to construct China as a threat and the failure of securitizing moves towards India. Hayes’s research therefore helps to explain deviation in U.S. policy towards rising powers that—as the world’s two most populous countries, each with growing economic and military power—could both represent a material threat to American interests. Much of the empirical evidence for these claims is fascinating. The successful securitization of China in the American public during the 1995-1996 Taiwan Straits Crisis, for instance, largely reflects a lack of shared democratic identity. When China threatened Taiwan during the island’s first democratic presidential election, the Clinton administration responded with the deployment of two aircraft carrier battle groups, a move “seemingly at odds” with U.S. policy at the point (140-141). Conversely, despite successive administrations’ considerable concerns, American audiences remained unconvinced of the threat posed by India despite the 1971 Bangladesh War or the evolution of its nuclear weapons program. In contrast to the case of China, the shared democratic identity of America and India helped to inhibit securitization and keep their relationship “in the realm of normal politics” (98). Beyond their value in explaining the history of U.S. foreign policy, to what extent can these insights help to anticipate what comes next? Hayes is willing to venture a prediction. Although “positive” about the future of U.S. relations with India, where “the possibility of securitization remains remote,” he sees the U.S-China relationship as “fragile” for as long as it remains undemocratic, with “ample ground… for dire predictions” (98, 158). Given the absence of significant political change in China, then, Hayes clearly shares some sympathy with the pessimists regarding the future of Sino-American relations. Throughout the book, Hayes considers how securitizing actors have constructed their policies vis-à-vis the American public. An important insight for policy makers is the strong connection between the identity of the public and the effectiveness of securitizing efforts. Scholars and practitioners should not take this point for granted. Indeed, domestic identity dynamics have tended to play a minor role in International Relations, especially in contrast to state-centric approaches (23-25). Hayes’s works provides further insights for policymakers, especially concerning democracy promotion. Analysis of identity suggests—if the democratic peace phenomenon is to spread—that democracy needs to grow internally; using force to impose norms of non-violent conflict resolution is unlikely to effective. Moreover, the use of force actually has the potential to damage the existing democratic peace. Failure to observe democratic norms weakens behavioral expectations or assumptions, thereby making it “easier for securitizing actors to credibly claim” that other democracies pose “an existential threat” (167). By paying attention to the mechanisms, dynamics, and processes that generate the democratic peace, Hayes offers a cogent theoretical explanation for why the phenomenon may not endure in its current form. The point at which such corrosion will undermine the zone of peace between democracies remains open to debate but the possibility of an eventual return to force is an important point often neglected by scholars and policymakers. Despite its many triumphs, Constructing National Security does leave some questions unanswered. Given that the American public plays such a key role in Hayes’s work, it deserves more attention at times. How do people know that another state is a democracy? In addition, to what extent does knowledge of the external state matter? Presumably, the ease of securitizing moves would vary according to the public’s education and familiarity with foreign actors. Such issues remain largely unaddressed, beyond passing mention on the final page, which is a shame. A broader challenge facing this book is securitization theory’s struggle to gain a substantive foothold in the U.S. discipline of International Relations, especially in contrast to its popularity in European academia. Some scholars working in other theoretical traditions might assume that Hayes’s work consequently does not provide sufficient additional value in comparison to existing approaches to the study of U.S. security policy. I would encourage them to reconsider, not least because much of his work seeks to inform rather than replace existing research. For those International Relations scholars prepared to embrace insights from other traditions, the approach developed by Hayes represents another useful instrument in their intellectual toolbox. Innovative and persuasive, Constructing National Security is a masterful analysis of U.S. security policy. Hayes has managed to produce a convincing theoretical account that yields valuable insights concerning the democratic peace, rising powers, and securitization theory. This book is a significant achievement and should inform the work of scholars and policymakers for many years to come. In Constructing National Security: U.S. Relations with India and China, Jarrod Hayes asks a question of great theoretical and policy significance: “How does democracy defuse security and in the process create a zone of peace in an international system often characterized by violence?” (1). In answering this question, Hayes both engages and extends the ‘democratic peace’ thesis, the idea that two democracies do not go to war against each other. While earlier scholarship has focused on policymakers, in terms of how they might be constrained by political institutions in democratic countries or how they share norms of nonviolent compromise with fellow democratic leaders (but not with their counterparts from nondemocracies), Hayes makes the important analytical move of highlighting the role of the publics in embodying democratic identity. He states that “the democratic identity is vested in the public, and it is the public evaluating the claim of a security threat” (2). The core argument presented in the book is that this shared democratic identity shapes security outcomes between two democracies. That is, democratic publics constrain policymakers’ attempts to create security threats out of other democracies. When two democracies are involved in diplomatic or strategic tensions, what could normally have been politicized as threats are defused, or desecuritized. This is because policymakers are able to minimize the perception of threat by highlighting the shared democratic identity and norms of a fellow democracy. Conversely, in dealing with nondemocracies, policymakers in democracies face less constraints in securitizing their counterparts. Moreover, politicians are able to effectively construct threats by publicly referring to the undemocratic characteristics of the regime in question. Hayes examines this differential impact of democratic identity against democratic and undemocratic counterparts through the foreign policy of the United States vis-à-vis India and China. One of the most impressive aspects of the book is the author’s use of the case-study method. Within the overall paired study design of a democratic-democratic dyad and a democratic-undemocratic dyad, Hayes selects important ‘near misses’ and focal points that demonstrate his core claims on the role of democratic identity: the U.S. involvement in the 1971 Bangladesh War and lack of action against India’s nuclear weapons program between 1974 and 1998; and the 1995-1996 Taiwan Straits Crisis and the 2001 crisis engendered by the collision of the U.S. Navy EP-3 surveillance plane and a Chinese J-811 fighter. Each of the case study chapters begins with a succinct summary of the existing literature and concludes with an overview of how each case fits into the overall argument. In terms of the book’s major theoretical contributions, two are particularly notable. One is the author’s expert weaving together of multiple theoretical traditions, including democratic peace theory, securitization theory (i.e., the Copenhagen School), and social identity theory. By doing so, Hayes is able to explain the paradox of why structurally constrained democracies do fight nondemocracies, even though they do not fight other democracies. More importantly, perhaps, the book shows that securitization involves democratic publics as well as policymakers. This is an important empirical illustration of a key argument put forth by securitization scholars: that securitization attempts must resonate with audiences and social contexts. Hayes argues that securitization in democracies such as the United States occurs in a distinct democratic socio-political context, or what the author calls security space, defined as “a set of meta-stable social and political structures…in which some securitizing moves are less likely to succeed while others are more likely to succeed” (19). Another interesting extension of securitization theory is the claim that securitization is not a one-time, isolated event, but rather part of a longer-term process. For example, in 1971, initial attempts by President Richard Nixon and National Security Adviser Henry Kissinger to securitize India, by deemphasizing India’s democracy and portraying India as a client of the Communist USSR, failed (64-66). Evidence from this Cold War encounter, however, does not clearly show that Nixon and Kissinger faced strong public pressure in terms of shared democratic identity. As the author admits: “Direct evidence of public acceptance or rejection of the Nixon/Kissinger securitization argument is sparse” (74). But the book’s accounts show that what had been a relatively weak shared-democratic identity vis-à-vis India in 1971 had stabilized by 2005. The signing of the U.S.-India nuclear deal provides the clearest evidence of how President George W. Bush, by referring to shared democratic identity, was able to “desecuritize Indian nuclear weapons in a context where nuclear weapons and their proliferation had been securitized” (92; emphasis in the original). In its eclectic theorizing of U.S.-India and U.S.-China relations during the Cold War and post-Cold War periods, the book is ambitious in both theoretical and empirical scope. Its claims are thought-provoking and offer multiple ideas and avenues for further research, particularly in the following two areas: the securitization/desecuritization distinction and the issue of multiple (or alternative) identities. The first question has to do with whether the evidence for democratic identity at work in securitization (construction of threat in democracies against nondemocracies) is as convincing as that for desecuritization (defusion of threat in democracies against other democracies). Hayes’s key claim is that democratic identity plays a role in both the construction and deconstruction of threat. In particular, the author claims that desecuritization becomes especially challenging with nondemocracies precisely because of the ‘us vs. them’ distinction highlighted by a democratic identity. But the distinction between securitization and desecuritization is sometimes difficult to assess in the empirical realm. A good example is the case of American security policymaking during the Taiwan Straits Crisis. According to Hayes, despite the Clinton Administration’s efforts to defuse public threat perceptions of China, Congress was able to push back (pretty successfully) to make China a security issue. The kinds of constraints that Nixon and Kissinger faced in their dealings with India were not at work in U.S.-China relations in 1995-1996. But what is less clear is the extent to which the Taiwan Straits Crisis (or the diplomatic crisis over the crash landing of the EP-3 plane) was securitized, in a manner that is distinguishable from cases of desecuritization. The book’s cases of securitization (Taiwan Strait Crisis) and desecurization (Bangladesh War) both resulted in similar U.S. foreign policy behavior: the dispatch of aircraft carriers to the conflict area. This is important because this display of U.S. military power is the highest level of ‘use’ of force in all of the case studies combined. Even if we assume that the Taiwan Straits Crisis was a clear case of securitization, what role did the United States’ democratic identity play? For example, did the lack of a shared democratic identity play a critical role in further prolonging or intensifying securitization efforts in the U.S.? The evidence presented in the book does not seem to suggest that in-group/out-grouping was occurring widely, as might be expected from the democratic identity argument. In fact, at some points, it appears as if the potential for a shared democratic identity in an unidentified future played a role in deescalating what could have been further securitization, had the U.S. Congress had its way. Does this mean that the mechanisms of democratic peace could work even if democratic values are not yet shared widely? Is this a China-specific conclusion, or something more generalizable? One possible explanation might be that increasing trade ties played a role in the long-term deconstruction of the ‘China threat,’ but this raises the question of how much of a role should be attributed to democratic identity, as opposed to economic interdependence and concerns for regional stability. The second theoretical issue raised by the book is whether or not democratic identity is as prevalent in other democracies. Hayes suggests that there is something unique about democratic identity: “Democracy in the form of democratic identity is a particularly important boundary condition because it links the domestic system (where social structures are strong) with the international system (where social structures are weak)” (20). He also states that democratic leaders, more so than their undemocratic counterparts, face large participatory audiences: “[D]emocratic securitizers are forced to construct the security claim using language that appeals to a diverse audience and that taps into existing threat construction frameworks…” (34). But outside of the U.S., it is not difficult to think of cases where democracy is one of many—perhaps even stronger and more resonant—identities. Scholars have demonstrated the importance of other powerful socio-political identities, including antimilitarism, anticolonial nationalism, autonomy-promoting nationalism and regionalism, Great Power-ism, and status-seeking, in Asia and elsewhere. Contemporary Japan-South Korea relations is a good example of how shared democratic identity does not appear to appease public attitudes or constrain leaders’ abilities to talk about seemingly illiberal policy stances in their democratic neighbor. Perhaps then securitization and construction of threat is both a long-term and interactive process, in which subsequent securitizing/desecuritizing acts respond not only to prior securitization/desecuritization efforts but the counterpart country’s actions. Relatedly, perhaps the findings from the book’s case studies could be further corroborated and/or extended by examining the processes of desecuritization/securitization in both sides of the democratic dyad so that we may assess whether shared identity is truly intersubjective at both the domestic and international levels—that is, “how shared understandings of the world shape foreign and security policy” (xi). This important book deserves to be read widely by scholars and policymakers interested in U.S. foreign relations in Asia, the international politics of rising powers, the theoretical and policy dimensions of democratic peace, and the role of socio-political context in security policymaking. There are lots of things to like about this book. Securitization theory goes to America. It solves a major puzzle for mainstream IR. How should I be able to not like this book? Beyond the self-interested reasons, it is a really good book. And it is short; a not unimportant quality in today’s over-published academia. The argument has presumably been summarized in other reviews in this roundtable, so I abstain from that. I would like to make three brief observations – and then three critical comments. The most important is the last – and on that one, I eventually give in. Probably. First: if this book had been written in Europe, there would most likely have been a long exegetic chapter on the by now quite large secondary literature on securitization theory and other critical security theories. (And the book would have been longer.) It is refreshing, how Jarrod Hayes gets right at it – takes the basic idea and largely shapes a theory of securitization of his own making. There are, however, places where I cannot help thinking, that here it would have helped if he had drawn on the discussions others have had, or not accepted a criticism given that the matter has been clarified in ensuing exchanges. I will indicate a few of these issues below. 1. A key argument in the book is that democracies are less inclined to securitize a threat from another democracy. It holds for the cases in the book. But surely, we see lots of securitization among democracies. Take the refugee crisis in Europe. It has been driven by at least four layers of securitization. First, there was and is a popular and populist reaction where foreigners are cast as a threat to the identity, safety, and welfare of people in both national and civilizational categories. This has little to do with our question whether democracies securitize against each other. Second layer: At an interesting point in the autumn of 2015, there was an attempt by Chancellor Angela Merkel of Germany and President of the European Commission Jean-Claude Juncker to depict the anti-migrant policies as a threat to Europe, both to the EU in institutional terms, but also to the identity of ‘us’ in terms of who we try to become – a figure very close to the foundational identity move of both the Federal Republic of Germany and of the EU. Note that here the alleged threat comes from democracies–member states–against a democracy, the EU, the European dimension of the same people. Naturally, it is a more complex constellation than the usual state-to-state one that the two polities in confrontation are here different layers in the same locale, but that is the complicated life of Europeans. Third: East European countries reacted strongly and depicted a threat from arrogant West European politicians and clearly signaled a willingness to overrule normally binding procedures to save their nation-states. Again, this was a securitization ‘democracy on democracy.’ Finally, the terror attacks, especially in Paris, Brussels and Nice made for a lateral link from one securitization to another, so that the securitization of the terror threat boosted the securitization of a threat from immigrants, and the process went full circle with the ‘normal’ anti-immigrant dynamic setting the scene. These cases are different from Hayes’s–probably because his are all about war. So–do his mechanisms anchored in democracies really prevent securitization vis-à-vis other democracies–or only securitization in one particular sector or at a particular level of intensity? The general theory of securitization is broader than this. It studies both more kinds of securitization and more kinds of effects than war, or more precisely: securitization always implies an opening to the use of extra-ordinary means, but these means might not be military. Therefore, it is possible that securitization can happen among democracies and have quite dramatic effects including extra-ordinary means like curtailing civil liberties, violating treaties or calling a national referendum to overrule a binding EU decision, like Hungary did in October 2016 as an element in the story above of layered securitizations. That move is in an EU context quite dramatic and potentially damaging, and it was justified–both the calling of the referendum as such, and the campaigning on the vote–with strong securitization about the threat from migrants and from EU imposition on Hungary of an acceptance of refugees not wanted. Thus, a large part of securitization studies covers cases where the mechanism identified by Hayes as relating to democracies does not seem to hamper securitization, and his general explanation therefore needs some further fine-tuning. All this is linked to a theoretical issue that might seem at first quite arcane. In the theory chapter, Hayes tweaks the theory towards ‘general’ securitization, away from ‘narrow’ securitization. The theory is interpreted as “Schmittian” [i.e. following the German legal scholar and political theorist Carl Schmitt] (15). There is an important difference between Schmitt and me (in addition to our differing positions on Nazism). As spelled out in other contexts, the Schmittian argument about the exception and the state of emergency is about a general state of exception in contrast to securitization theory’s case specific exception. Schmitt’s argument is about how sovereignty rests with the one who can decide on the state of exception, and more generally how the exception is more important than the rule, because it is the moments of pure will and force intersected between periods of ‘normality’ that really tell us what is the political nature of the situation, not the normality because it can by definition not control the exception. Thus, Schmitt’s argument is–to simplify a little–about the possibility of declaring a general crisis and thereby gaining the ability to found a new order. As we actually see these very days (2016), a state of emergency can mean very different degrees of ‘re-writing the rules’ if we compare France after the terror attacks, Turkey after the failed coup, and some U.S. states hit by a hurricane. The radical and in some sense foundational Schmittian exception is quite different from securitization theory, where the mechanism is about an exception within an otherwise continuous order. A securitizing actor points to a threat and the need to fence it off, thereby justifying particular extra-ordinary measures. In support of a more Schmittian reading of securitization theory and against the ‘limited’ interpretation I gave above, some might argue that any limited securitization is only limited until the securitizing actor finds it necessary to make it general. This rests on the widespread mistake of assuming that the securitizing actor unilaterally decides, where the theory actually places the ultimate decision with the audience. A more sophisticated expansive interpretation would argue that the security argument is inherently open-ended, since it is the structure of securitization that ‘this can’t be allowed to happen’ and therefore there is an element of ‘do whatever it takes.’ However, this only goes for the securitizing move (the attempt by the securitizing actor), the act of securitization has only been carried out when the move is accepted by the relevant audience, and this entails that it is the full package of defended referent object, alleged threat, and posited defensive measures that are accepted, and thus an act of securitization usually does not entail a free hand for an actor to do just anything. The general order has not been suspended. The Schmittian slippage in Hayes’s reading of securitization theory might be relevant to the problem that he has de facto confined his cases to ‘high end’ or ‘war related’ securitizations, because by tweaking the theory in the Schmittian direction of ‘all out securitization’, instances that are more local within a specific sector and thereby directed to other means than war, gets overlooked. A second critical question relates to the case selection. All the cases are on the United States. There are two dyads, but the book only looks at one side of each. Years ago I read in some (German?) text that I can’t track down at present the quip that one should always be a little wary when confronted with ‘a case like the U.S.,’ because especially in IR, the U.S. is often not really a good case of anything but of the United States. Sometimes for structural reasons (position in the international system) and sometimes for domestic reasons, the U.S. is often a special case. Therefore, it is potentially problematic to write generally about democracy in abstract terms and posit this as demonstrating dynamics relating to identity. In the case of the U.S., democracy doubles as both identity and ideology, as both something to unify around and as an element of the substance of world politics. Democracy is more closely related to the interpretative frame in the case of the U.S. than in some other democracies, i.e. the idea of democracy plays a more active role. It would have been very useful to see more on the India and China sides of the cases studied here. And further on, the study could usefully be extended to some cases involving, for example, European actors. As for the third criticism, the key element in Hayes’s argument is a ‘mechanistic’ explanation of how securitization is circumscribed in democracies. Hayes coins in this context the concept of ‘Security Space’ with “gradations of increasing social difficulty” (22). This is his most revolutionary contribution to securitization theory. This is one of the places where some of the existing theoretical literature could have helped. It has been suggested regularly by critics that the theory should give a stronger causal explanation of when securitization happens or not. However, the lack of specificity in the original Copenhagen version of the theory is not the result of absent-mindedness. There has been from this (my) side of the theory debates a willful resistance against moves like the one Hayes suggests, mostly for two reasons. First, it goes against performativity. Hayes tends to make the set-up too sequential (see 19 especially). In his version of the theory, it can first be ascertained what are valued referent objects, and only afterwards kicks in the possible defense of these. As pointed out by Mike Williams and others in previous debates, whether a referent object is valued enough is not given independently of securitization and before it: some things become valued by being threatened and defended (retroactive performativity). At times this is put forward as the standard post-structuralist identity based critique of securitization theory, and in the case of Williams it is defended as an element of the theory, which in itself became an act of retroactive performativity, because his defense of the theory on these terms made this more consciously respected by its inventors. Second, an argument I have been making regularly is that the openness and indeterminacy of the theory is linked to the political implications of the theory. In order for the theory to serve its key purpose of making responsibility inescapable for anyone (policy maker or scholar) who pronounces on what is a security issue, it is crucial that this is in the full sense an act. There is a close link between the concept of politics in the theory and where causality is located and where it is not tolerated in the analytical model. This relates closely to arguments in speech act theory (especially the original Austin version as clarified by Marina Sbisà), where the illocutionary act brings about effects in a manner different from normal cause-effect sequences. The securitization act is at its heart therefore not a cause-effect thing, but politics of the illocutionary kind, involving a renegotiation of deontic modal competences, i.e., rights and obligations. It is therefore important to protect the ontology of the event of securitization as such. However, the careful way that Hayes introduces a moderate form of causality with his concept of the ‘security space’ suggests that actually I might have been too dogmatic. A conditioning of the space for the speech act of securitization seems compatible with the ultimately political nature of the event. The case studies especially convince me that it is possible to have this probabilistic ‘security space,’ and still focus on acts in a responsibility making manner. His theoretical moves seem compatible with the concepts of facilitating conditions in the original formulation. It would in this context have been an advantage if the book had engaged explicitly with the reasons given in the theory debates for the non-causal set-up. Ironically, this is in the end maybe more of a loss for Hayes than for non-cited scholars, because it is likely that Hayes would actually be able to show that he has handled the issue in a way previously deemed impossible. If so, the book is even more remarkable than what is made explicit. Thus, my third criticism is the most serious for the whole project; but in the end, it is likely that this debate will eventually come out on Hayes’s side, not the possibly exaggerated position I have taken myself. It would be most helpful for securitization theory to have this issue explored in further debates. In sum, Jarrod Hayes has written an important and inspiring book. It is a brilliant illustration of the possibility of bridging different sub-cultures in IR with productive effects for all. He brings social psychology together with securitization theory and gets the resulting construct to make an original contribution to the democratic peace debate, which has generally been anchored in very different corners of the discipline. And this move has important repercussions on the theories he draws on. I am incredibly grateful to the H-Diplo editors and reviewers for this roundtable review. In this, I go beyond the de rigueur expressions of thanks that typically front the author’s response. To have rising stars (David Gill, Seo-Hyun Park), an academic luminary (George Lawson), and a personal intellectual hero (Ole Wæver) read and seriously engage with my first book-length academic project was beyond my wildest hopes when the editors first approached me. One of the great wonders of academia is that our luminaries walk amongst us, and that is certainly the case in the roundtable. These scholars addressing my work in this forum is a great personal treasure. Of course it is all the more gratifying that the three reviewers generally approve of the book. Not surprisingly, I agree with their kind praise and positive appraisals. Perhaps more surprisingly, I also agree with their critiques. Constructing National Security is an important waypoint in my theoretical and intellectual engagement with the forces that drive international conflict. The critiques the reviewers touch upon are limitations, intentional and unintentional, that hopefully mark the book as a starting point of inquiry rather than any kind of final word. Thus, in my response I seek not to refute the reviewers’ critiques—after all, I agree with them—but rather comment on the source and significance of the limitations they observe. I will start with Seo-Hyun Park’s observations before moving on to David Gill’s review and ending with Ole Wæver’s. Park’s first significant critique regards the distinction between securitization and desecuritization. This is an important distinction for the theoretical framework I lay out in the book, that identity shapes constructions of the presence and absence of threat. She notes that in two of my cases that purport to show opposing political dynamics—the 1995-1996 Taiwan Straits Crisis for securitization and the 1971 Bangladesh War for desecuritization—the outcome was the same: deployment of aircraft carrier battle groups. And, indeed, the deployments do suggest the presence of security politics. However, the differences in terms of where securitization occurs are crucial. In the former, as Park notes, securitizing moves played out in the public in such a way that they pushed President Bill Clinton—who was not personally disposed to deploy force—to deploy carrier battle groups in response to political and public pressure. In the latter, President Richard Nixon deployed a carrier battle group despite elite political pressure to the contrary and no general public support. What Park identifies is an underdeveloped aspect of the theoretical approach: securitization takes place at multiple levels, often simultaneously. My focus was on how it plays out in the public sphere because, as per my focus on democracy, the explicit role of the public in politics is a defining feature of democracy. So both cases do represent securitization, but from the standpoint of my level of analysis, only the Taiwan Straits Crisis represents successful securitization, while the Bangladesh War is a failure of securitization even though the outcomes look very similar. And indeed, we might read the carrier deployment in 1996 as further sedimenting in the public’s imagination the idea that China was a threat because the policy was so public. Conversely, the 1971 deployment and the political costs that emerged once the policy became public may very well have substantially contributed to the Nixon Administration’s remarkable nonresponse to India’s 1974 Smiling Buddha nuclear test. Park also identifies a limitation in my conception of security politics. I will not go into depth here, as Wæver also notes this limitation in a more comprehensive manner, so I will reserve the bulk of my thoughts for my response to him. Here I will note that my terminology was imprecise. While desecuritizing moves took place in 1971, it is not a case of desecuritization but rather, at least at the level of analysis that concerns me, of nonsecuritization or failed securitization. Desecuritization (and the politics surrounding it) is very different from non or failed securitization and it is a distinction that should be clearly and precisely made. Park raises two further substantive questions, both of which I read as questions of generalizability. The first pertains to the dynamic under both Bill Clinton and George W. Bush of using the concept of engagement to, as I put it, borrow from future democracy in China to defuse securitizing moves in the present. Park questions whether the democratic peace could be extended to any nondemocracy or if this dynamic is particular to China. The short answer is, I do not know. The finding was entirely unanticipated on my part, and only further empirical work will determine whether the dynamic takes place in other contexts. In principle, political leaders could make such a claim about any nondemocratic country (as I show in my 2009 article in International Studies Quarterly, then Senator Joe Biden talked up Iran’s democratic attributes to counter securitization by the Bush Administration), but whether such claims have plausibility is another question. The answer, I suspect, depends greatly on the historical and political context of the claims. The second raises the question of how pervasive or powerful democratic identity is outside the U.S. (a question Wæver raises as well) as opposed to other identities (notably, she raises adversarial national identities in the Japan-South Korea relationship). I think democratic identity travels. I recently published an article in Foreign Policy Analysis showing democratic identity in action in the UK in the lead up to the Iraq War. But, as I note in the book, other identities are available to vie with democratic identity, and it may very well be the case that democratic identity is weaker in some democracies than others. To a degree, this is a limitation bound up in reality: identities, and their activation, are contingent. The existence of a democratic identity is meaningless from the standpoint of understanding behavior and outcomes if it is never activated. And what that identity means will change in time. So it may be impossible to do more than theorize that democratic identity is important and a powerful socio-discursive tool available to securitizing actors, but no more. Park (and Wæver) also puts her finger on a limitation in terms of the empirical scope of the book. Ideally, I would have examined a range of states across time, including the Indian side of case studies in the book. When I was writing the book, these were considerations that prompted difficult decisions. In the end, I hoped that by demonstrating the veracity of my approach in the U.S. across time the book would serve as a foundation for future work probing ever further afield and might prompt others to do so as well. Sometimes it is possible to read limitations not as weaknesses but rather as possibilities, and I think the limitation in empirical scope can be understood in that way. Gill notes a different limitation, one that goes to the core of the argument: how do people know the nature of the external state. He is quite right in noting with some dismay that I give only brief attention to the issue. In part, that is because the topic would expand the pagination of the book dramatically. But in (larger) part, I think the reason I do not address this at length is that I do not think IR and international security scholars have a very good answer. My sense is that, in international relations and certainly international security, questions of knowledge have largely been limited to the elites (usually highly educated through well-defined and often doctrinaire channels), and quite often asked in game theoretic contexts (e.g. strategic decisionmaking with imperfect information). This has I think allowed IR and international security scholars to elide fundamental questions of what and how society and elites know, or think they know, about the world. What is the role of formal education? The media (and which media)? Political leaders? These questions in the United States have come to the forefront with the election of Donald Trump to the presidency and his administration’s embrace of what one senior member famously called ‘alternative facts.’ If social reality is constructed, as the Trump Administration seems to have laid bare, then questions of what and how states and societies know about the world must come to the forefront of inquiry and theory. Thus, Gill hits on an important limitation of the book (or, opportunity for further scholarship), but in so doing I think identified a crucial limitation in IR and international security scholarship that is reflected by the book. Of all the reviewers, perhaps not surprisingly it is Wæver who most clearly exposes the theoretical and creative limitations of the book. When I was developing the book’s theoretical framework, I approached securitization theory coming out of an American political science context. As Wæver notes, I was clearly looking for a tool that would help me come to terms with how collective conceptions of self and other shape security outcomes. Securitization theory was the key that released the lock. But that approach led to some of the limitations Wæver notes. Particularly, my engagement with the securitization literature was left underdeveloped. It was not that I did not read that literature. Far from it: I was voracious in my efforts to track down every substantial article and book using or addressing securitization theory, and read nearly everything I found. But the goal was not really to engage with core debates about securitization theory. Rather, my agenda was more instrumental, trying understand how securitization theory was being used and how I could bring it to bear in service of my intuition that identity matters for security outcomes. I was also, as new scholars are wont, eager to put my stamp on securitization theory by ‘improving’ it: finding and remedying a ‘weakness’ in the approach. I engaged with the literature with that goal in mind, but again in an instrumental way. I have since come to see that as naïve. Securitization theory is a foundation on which to build theories of security. As such the goal is not to ‘fix’ securitization theory but to build theories on it, in my case by drawing on elements of social psychology. It also led to a relatively shallow engagement with securitization theory, which ironically blinded me in terms of making some bigger claims about how to use securitization theory—claims that Wæver very helpfully highlights (more on this below). Given my theoretical training and focus on ‘traditional’ security concerns, I was also unduly limited in my core conception of securitization theory, focusing far too much on Schmittian exceptionalism and less on what I now perceive is the theory’s political, Arendtian center of mass. This in turn leads to an overemphasis on locating the Schmittian moment of exceptionality and less on the political dynamics of security, though Wæver’s formulation of securitization kept me from going too far afield in this regard. The focus on Schmittian exceptionalism with a desire to bring securitization theory to bear on traditional security issues created the first limitation Wæver notes—a certain blindness to the reality that securitization does occur between democracies. I was simultaneously too broad and too constrained in my conception of securitization. Too constrained in the sense that I was focused on a specific political process, one that potentially leads to the use of force. I was too broad in my conception because I failed to distinguish the security politics surrounding the potential use of force from other security politics. So Wæver is quite right, the book does not speak to all security politics between democracies, only a specific type of security politics within the military-political sector. I think that limitation is not detrimental to the agenda of the book, but I should have been more careful in staking out the scope of my claims. That care would have also have enhanced the impact of the claims I make. The Schmittian focus also undermines my ability to convey the particular applicability I saw in securitization theory for talking about security in democracies. Securitization theory’s emphasis on the audience and the positioning of security within the general political order—in which political leaders as securitizing actors are still held accountable for their policy decisions—were crucial elements informing my reading of securitization theory. The agency (and responsibility) of the securitizing actors for their security claims was also central to my reading of securitization theory and my application of it in the book, where the Arendtian aspect shines through a bit. But the Schmittian emphasis masked these elements of my understanding and application of securitization theory. All of this I think leads to the greatest limitation of the book, embodied in Wæver’s third critique: a limitation of imagination. My conceptualization of a security space grounded in the social and political structures (and all they entail: history, education, shared conceptions of self, etc.) of society was intended to try to come to terms with how analysts can think about the limits of plausibility in security. It does not eliminate political agency but bounds it; full responsibility remains undiminished. As Wæver notes, I wrestle with a very loose form of causality channeled through an effort to understand what might plausibly happen. There is more depth to these ideas than I realized, and they touch on important debates in securitization studies that I missed because of my narrow, instrumental reading and focus on the Schmittian exception. So the greatest limitation is not in a failure to put forward useful ideas, but failing to understand their potential significance for broader theoretical discussion. In the end, as Wæver rightly observes, the cost of this limitation is not to the reader but to me as the author. By constraining my conception of its theoretical significance, this limitation of imagination reduces the book’s intellectual impact. Hopefully, Wæver’s work in this review will go some way toward belatedly expanding the book’s horizons. James Strong, Public Opinion, Legitimacy and Tony Blair’s War in Iraq (London: Routledge, 2017). For further detail on key elements of the book, see Jarrod Hayes, “Identity and Securitization in the Democratic Peace: The United States and the Divergence of Response to India and Iran’s Nuclear Programs,” International Studies Quarterly 54:4 (2009): 977-999; and Jarrod Hayes, “Securitization, Social Identity, and Democratic Security: Nixon, India, and the Ties That Bind,” International Organization 66:1 (2012): 63-93. On the evolution of the literature, see Jarrod Hayes, “The Democratic Peace and the New Evolution of an Old Idea,” European Journal of International Relations 18:4 (2012): 767-791. For more on this debate, see Jarrod Hayes, “Securitization Forum: Introduction and Setting the Scene,” Duck of Minerva (blog), 16 September 2015, http://duckofminerva.com/2015/09/securitization-forum-introduction-and-setting-the-scene.html. For evidence that Hayes welcomes the use of analytical eclecticism, see Jarrod Hayes and Patrick James, “Theory as Thought: Britain and German Unification,” Security Studies 23:2 (2014): 399-429. Peter J. Katzenstein, Cultural Norms and National Security: Police and Military in Postwar Japan (Ithaca: Cornell University Press, 1996); Thomas U. Berger, Cultures of Antimilitarism: National Security in Germany and Japan (Baltimore: The Johns Hopkins University Press, 1998); Manjari Chatterjee Miller, Wronged by Empire: Post-Imperial Ideology and Foreign Policy in India and China (Stanford: Stanford University Press, 2013); Amitav Acharya, Constructing a Security Community in Southeast Asia (London and New York: Routledge, 2001); Alice D. Ba, (Re)Negotiating East and Southeast Asia: Regions, Regionalisms, and the Association of Southeast Asian Nations (Stanford: Stanford University Press, 2009); Ayse Zarakol, After Defeat: How the East Learned to Live with the West (New York: Cambridge University Press, 2011); Ted Hopf, Reconstructing the Cold War: The Early Years, 1945-1958 (New York: Oxford University Press, 2012). From Jef Huysmans, The Politics of Insecurity: Fear, migration and asylum in the EU (London and New York: Routledge 2006) to Thierry Balzacq, ed., Contesting Security: Strategies and logics (London and New York: Routledge 2015)–with the so-called ‘CASE manifesto’ as probably the most famous framing of a great debate: Collective, C.A.S.E. (2006) “Critical Approaches to Security in Europe: A Networked Manifesto,” Security Dialogue 37(4): 443-87. For a socio-political explanation of these theoretical trends, see Ole Wæver, “Aberystwyth, Paris, Copenhagen: The Europeanness of new ‘Schools’ of Security Theory in an American Field,” in Arlene B. Tickner and David Blaney (eds. ), Thinking International Relations Differently, Worlding beyond the West, vol. 2 (London & New York: Routledge, 2012), 48-71, and Ole Wæver “The History and Social Structure of Security Studies as a Practico-Academic Field,” in Trine Villumsen Berling and Christian Bueger (eds.) Security Expertise: Practice, Power and Responsibility (Abingdon and New York: Routledge. 2015), 76-106. Specifically for critical assessments of securitization theory, see Ulrik Pram Gad and Karen Lund Petersen (eds), “The Politics of Securitization,” special issue of Security Dialogue 42:4-5 (2011); and Thierry Balzacq ed. Securitization Theory, How Security Problems Emerge and Dissolve, Milton Park (Abingdon: Routledge 2011). Probably, the most comprehensive discussion of the theory (with references to much of the secondary literature) is to be found in Juha Vuori, How to Do Security with Words: A Grammar of Securitization in the People’s Republic of China (Turku: University of Turku, 2011). Ian Traynor, “Refugee crisis: Juncker calls for radical overhaul of EU immigration policies,” Guardian, 9 September 2015. Ole Wæver, “European Integration and Security: Analysing French and German Discourses on State, Nation and Europe” in David R. Howarth and Jacob Torfing (eds.) Discourse Theory in European Politics: Identity, Policy and Governance (Basingstoke : St. Martin’s Press, 2005), 33-67; Ole Wæver, European Security Identities, Journal of Common Market Studies 24:1 (1996): 103-128 (updated version as “European Security Identities 2000” in J Peter Burgess and Ola Tunander (eds), European Security Identities: Contested Understandings of EU and NATO. PRIO, Oslo, s. 29-56. PRIO report, nr. 2, vol. 2000. In this sense, Hayes’s argument is actually close to the central mechanism in the original conception of a security community by Karl Deutsch, because this is made up of states that are unable to imagine using force against each other, and thus a securitization in that direction becomes difficult. Deutsch’s concept of ‘security community’ is really a non-war community or even more precisely a ‘non-imaginability of war community.’ However, it does not seem to rule out that securitization can be in play among the members of a security community, only it should not be hinting at the use of force as the way to defend against the alleged threats. Cf. Ole Wæver, “Insecurity, Security, and Asecurity in the West European Non-War Community” in Emmanuel Adler and Micharl Barnett (eds) Security Communities (Cambridge: Cambridge University Press, 1998). Carl Schmitt, Politische Theologie: Vier Kapitel zur Lehre von der Souveränitet (Berlin: Duncker & Humblot, 1934); Scmitt, Der Begriff des Politischen (Berlin: Duncker & Humblot, 1927). Ole Wæver, “Politics, Security, Theory”, Security Dialogue 42:4-5 (2011): 465-480. On page 14, Hayes is a little imprecise on this, equating securitizing move with the securitization speech act, which is not correct. This has consequences both because it erases the limit involved in an audience only accepting the securitization when linked to specific measures, and this conflation more basically opens for a Schmittian decisionism, because then the securitization can be carried through unilaterally by the securitizing actor without the audience. See, for example, Matt McDonald, “Securitization and the construction of security”, European Journal of International Relations 14:4 (2008): 563-587; Holger Stritzel, “Towards a theory of securitization: Copenhagen and beyond,” European Journal of International Relations 13:3 (2007): 357-383. Michael Williams, “Comment on the ‘Copenhagen Controversy’,” Review of International Studies 24:3 (1998): 435-441 and “Security and the Politics of Identity,” European Journal of International Relations 4:2 (1998): 204-225. Wæver, “Politics, Security, Theory,” op.cit. ; Wæver, “The theory act: Responsibility and exactitude as seen from securitization” International Relations 29:1 (2015): 121-127. Marina Sbisà, “How to Read Austin,” Pragmatics 17:3 (2007): 461-473; Ole Wæver, “Speech Act Theories of Securitization: Illocutionary Insistence and Political Performativity,” paper presented to a CAST research seminar, 5 December 2015. Barry Buzan, Ole Wæver and Jaap de Wilde, Security: A New Framework of Analysis (Boulder and London: Lynne Rienner; 1998). Jarrod Hayes, “Identity and Securitization in the Democratic Peace: The United States and the Divergence of Response to India and Iran’s Nuclear Programs,” International Studies Quarterly 53:4 (2009): 977-999. Jarrod Hayes, “Identity, Authority, and the British War in Iraq” Foreign Policy Analysis 12:3 (2016): 334-353. Ted Hopf’s work on habit and common sense is an obvious exception to this point. Among his various works, see Ted Hopf, “Common-sense Constructivism and Hegemony in World Politics,” International Organization 67:2 (2013): 317-354. Previous Previous post: Policy Series: A Double Standard?